With a mix like this you get a very rich and unusual blue-green! 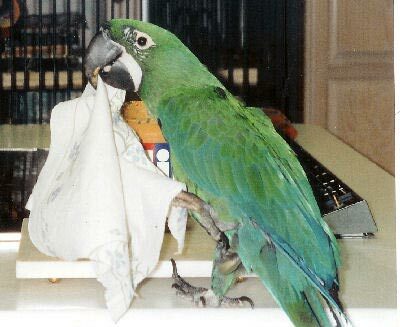 Macaw hybrids have been traditionally bred for color. The Milicinth Macaw is a fabulously colored hybrid cross between a Hyacinth Macaw and a Military Macaw. The offspring are influenced by the traits and characteristics of both of its parents. Father's have the dominant gene, so this will generally influence the offspring's coloration and overall appearance. However the Milicinth's gorgeous coloring is blended from both of these striking parents. The Milicinth Macaw is a first generation macaw, meaning its parents are two species of naturally occurring macaws. Being a cross between a Hyacinth Macaw and a Military Macaw gives it some very desirable traits. The Hyacinth Macaw is sweet, affectionate and extremely gentle. Hyacinth's are not inclined to make a great deal of noise and have a very even temperament. The Military Macaw is a favorite pet macaw that also has a good temperament. It is very trainable and highly intelligent. The behavior and temperament of hybrid macaws are more unpredictable and uncertain than the coloration. A Milicinth Macaw can often have the gentle shy nature and sweet temperament of the Hyacinth Macaw. They can be extremely loving and huggable, enjoying contact and interaction with one or more people, as well as other birds. Attributes they can inherit from the Military Macaw side are cleverness and being quick to learn tricks. With both these traits you can have a very smart and loving pet. Milicinth Macaws are an inquisitive and outgoing bird when well established and comfortable in their home and surroundings. But they can also be very territorial in their own space, such as their cage or aviary, As with all macaws, they will require good socialization and consistent training to make good pets. Scientific name: The Milicinth Macaw is a first generation hybrid macaw. It is a cross between a Hyacinth Macaw Anodorhynchus hyacinthinus and a Military Macaw Ara militaris. it is also sometimes known as the Milihy Macaw. Description: Milicinth Macaws are a beautiful blue-green macaw, pulling these beautiful colors from their parentage. The Hyacinth Macaw contributes the rich blues and they pick up the greens from the handsome Military Macaw. In the mating pair, the Male has the dominate gene. They are a full size Macaw. From their heritage they can be very loving and gentle, have the potential to learn to perform tricks, and may even say a few words or expressions. Size - Weight: The Milicinth Macaw is a full sized macaw. With the smaller Military Macaw reaching up to 27" (75 cm) and the Hyacinth Macaw at 39" (100 cm), they will reach a size somewhere in the middle. In the wild, their parent species eat a variety of palm nuts, fruits, and seeds. A Hyacinth Macaw will eat mainly raw nuts. Provide your Milicinth Macaw with nuts and a good parrot mix which includes; formulated diets, seeds, dried fruits and nuts. Nuts you can provide them include Brazil nuts, walnuts, macadamias, filberts, almonds, and hazel nuts. They will also like fresh coconut. They may also be offered fruits and vegetables. For good strong development, babies will need a high fat content in the hand-feeding formula. Social Behaviors: They are a typical macaw. Macaws are affectionate, inquisitive, and intelligent but can be cranky at times. They make them a great companion not only for a single person but when well socialized are friendly with everyone, even other birds. Availability: This bird is generally hard to find and are expensive. There are more and more macaw breeders however, so finding these macaws for sale becomes easier as they become more common. I cannot agree more that yes this hybrid makes a beautiful macaw... but doesn't the fact that the Hyacinth is as rare and endangered as it is, make crossing it with another breed a bad practice. Personally I hope the breeder is still breeding straight hyacinths with the intention to better the breed and not just mixing it to sell "rarer" birds. The hyacinth being on the critical list should sort of discourage breeding like this but that is just my opinion. Breeding hybrids will encourage people to help both species. that is a rediculous satement it helps nether it hurts both it destroys the purity of both species please dont encurage it. I am extremely saddened at how far someone that calls themselves a breeder will go to make a hybrid. A Hyacinth is an endangered creature and should only be bred as a Hyacinth. I realize (sadly) there is no governing of breeders and they have free will to breed however and whatever they want together and that includes mixing and matching. I would only hope their moral thinking will drive them to do the right thing. I agree with the statement above. I have both sexes of Hyacinths and NEVER would hybridize them. They are beautiful just the way they are. I do think the hybrids of the other Macaws are beautiful, just not the Hyacinths. I purchased the hyacinth/military hybrid from a Dr. Miller in Miami about 15 years ago. My first milicinth I named Samari and he was the most intelligent macaw I had and I had a bunch of them. He never ever used his beak, to climb up a person, on a shoulder even if a person he did not know squeezed him. His favorite trick was pretending he was dead - hanging from a light fixture and when someone would walk by he would jump on them. He turned the water on in the kitchen sink and showered. There is no end to how wonderfully gentle and smart this fella was. I have a female milicinth macaw, anyone knows any breeders?